Last Sunday evening, I saw a food truck a few blocks away from my home with enough smoke coming out of it for me to think it sold pit beef sandwiches, so, I made a point to patronize it this Sunday. Then, I would write about it as this week's simple pleasure. I love pit beef; it's my favorite sandwich. Pit beef starts off as a roast that is grilled over charcoal, sliced thin and then served on a roll. It is so flavorful that you don't need any sauce. Usually you see pit ham on the same menu. I'm coming to realize in recent years that pit beef is a Maryland thing. I think I got hooked on them attending my town's carnival every summer while growing up. My parents live a block from the carnival grounds. My family and I also enjoyed them at a restaurant called Bull on the Beach located in Ocean City, Maryland. I come from a family that grills (hamburgers, hot dogs, and steak) 12 months a year, even with snow on the ground! ...so I love that kind of food. The food of summer is more tempting to me than that of any other season. Now, there is a restaurant in my hometown that sells pit beef year-round, plus another in the next town over. Since they're sold at carnivals and fairs during the summer, I usually find myself picking it up at these special events. I only manage to come across it once or twice year and when I do, I savor this sandwich. It's special. Tonight, when I unwrapped my packaged sandwich at home, it was not the regional specialty I adore, but a lot of beef pieces soaked in spicy barbecue sauce on a cheap hamburger roll. Of course, all that sauce reduced the bottom of the roll to nothing. It was fine, but not at all what I was expecting. After looking forward to it for a week, I was so disappointed! I ate half of the meat for dinner, justifying that it was so expensive, but I actually might toss the rest... I heard him offer collard greens as a side to another customer, which I smiled at as a Southern specialty, reminding me that I lived in South Carolina for college. He probably isn't from around here, but from somewhere in the South. Luckily, the carnival's in town next week and I can pick up the real deal there! On my Philadelphia plate, slightly bigger than the rest of my dinner plates. Does it surprise you that I grill the slices of baguette? My dinner, with vino rosso, certo! The tomato mixture in a latte bowl from Anthropologie. I grew my own basil. 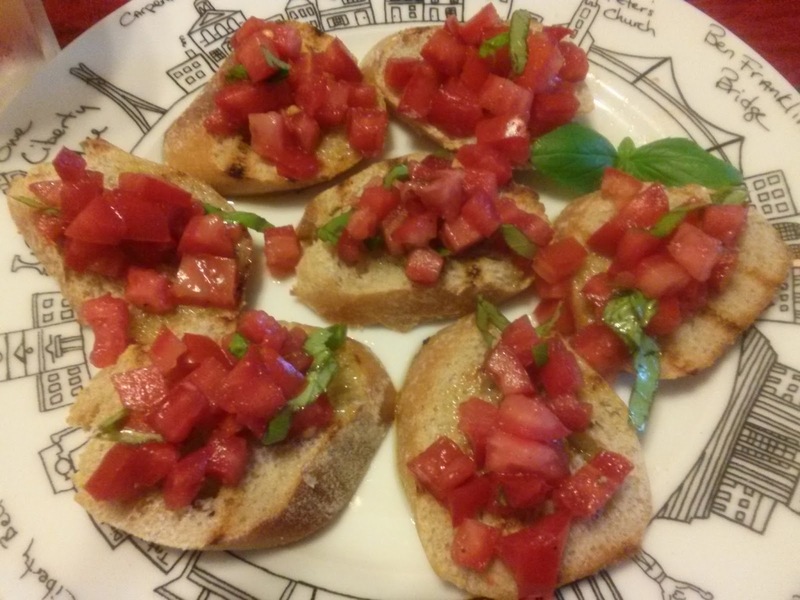 Making bruschetta is easy. 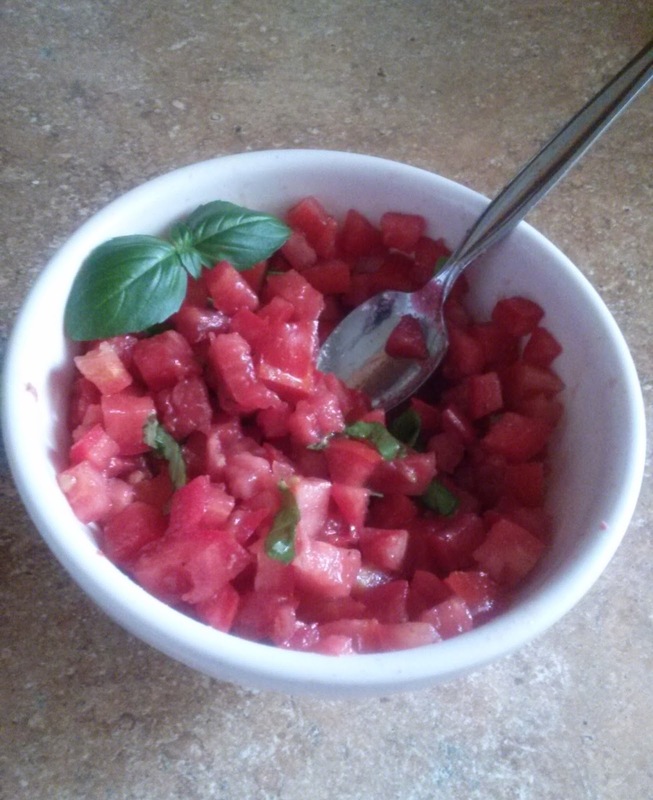 First, I remove the seeds from halved tomatoes with a spoon before chopping them into tiny cubes. I also roll several basil leaves and cut the roll diagonally many times. Next, I place the tomatoes in a bowl and then stir in a bit of the following: salt, freshly-ground black pepper, good olive oil, balsamic vinegar and short ribbons of fresh basil. I slice a baguette at an angle and then grill each side. After that, I cut a garlic clove in half and rub the cut side all over one side of the grilled bread. I drizzle the bread with some more good olive oil. I either serve the bread and topping separately or spoon the topping onto each piece. As everything falls off as you eat, please note that this is not ideal first date food. 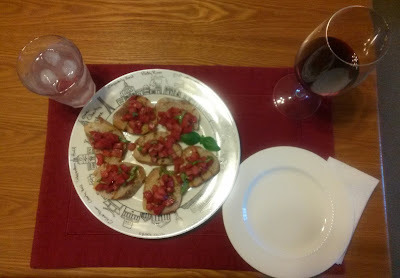 Since the tomatoes are ripe and taste like they should during July, like my beloved pit beef, bruschetta tastes best when eaten in the summertime.